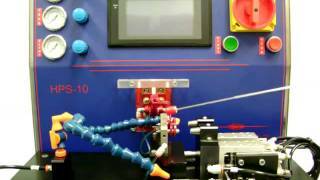 To meet the growing market need for a scalable and multi-functional catheter production system, PlasticWeld Systems developed the HPS10-MXP multi-function interchangeable platform system. This system utilizes interchangeable tool pallets, quick-change electronic & pneumatic connectors and on-board programming to provide the most versatile bench top equipment available. Users are able to quickly change between pneumatic or electric slide tipping, flaring, flanging, eye forming, tube bonding and end forming – utilizing the same base machine. Most tool pallets are scalable with a choice of 1-up or 2-up configurations. This format is especially suited to lean production work cells, R&D departments and small batch production environments. Flexible system allows for changing molds, heater coils and heater position. Ideal for R&D engineers trying to test new concepts. Base machine is pre-wired to accept all tooling platforms. Quick change plate mounts, pneumatic and electric connections enable 5 minute change over between any two pallets. PLC and Color Touch-screen Operator Interface control all mechanical functions and provide program storage. 0-100% step-less power, heat On/Off and diagnostic functions are all controlled through the Operator Interface Panel. Constant current control within ± 0.5% of a 10% line voltage variation. Easy clean Stainless Steel Cabinet with integrated work platform. Water cooled coil and tool holder. Simple adjustment for correct coil placement. Cycle initiation by panel push button or foot pedal switch. PWS standard program, with 20 data-set storage capacity and no security lock-out codes.